Yesterday on Valentines Day, Pasquale Rotella gave us some love with a very special episode of Night Owl Radio where he shared the EDC Las Vegas 2018 lineup. The theme of the three day festival taking place on Friday, May 18th, Saturday, May 19th, and Sunday, May 20th at the Las Vegas Motor Speedway was also revealed to be Kinetic Love. Taking a look at the lineup, there are a number of serious back to back sets going down as well as a number of DJs that fans are looking forward too. 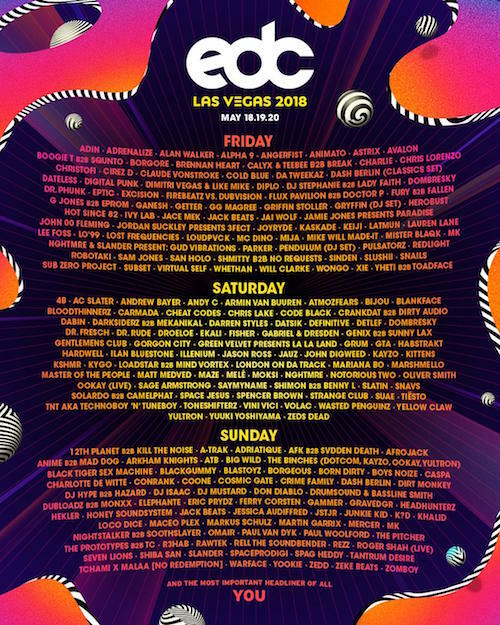 Friday will see the likes of Astrix, Chris Lorenzo, Da Tweekaz, Diplo, Dombresky, Excision, Flux Pavilion b2b Doctor P, Getter, Herobust, Hot Since 82, Jack Beats, Jordan Suckley presents 3fect, JOYRYDE, Kaskade, LO’99, NGHTMRE & SLANDER present Gud Vibrations, Pendulum (DJ Set), Redlight, San Holo, Slushii, Snails, Virtual Self, and Whethan. The list for Sunday includes A-Trak, Born Dirty, Boys Noize, Caspa, Coone, Cosmic Gate, Dash Berlin, DJ Isaac, Don Diablo, Drumsound & Baseline Smith, Eric Prydz, Gammer, Headhunterz, k?d, Loco Dice, Maceo Plex, REZZ, Seven Lions, Shiba San, Tantrum Desire, Tchami x Malaa (No Redemption), and Zedd. Who are you most excited to see? Take a listen the Night Owl Radio 130 to hear a little bit of each artist who is playing Under The Electric Sky!